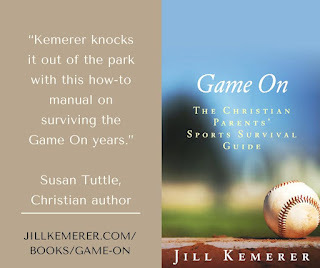 My good friend Jill Kemerer is known for her fiction works, but recently God laid a non-fiction subject on her heart. After much prayer, she decided to tackle it. What followed was her newest book, Game On. I had the privilege of reading and endorsing this book, and today I'm reviewing it here for you. Here's a short blurb and we can chat on the other side! For years I couldn't escape the anxiety that came with my children’s sports. The competitive atmosphere prevalent among parents often left me anxious, upset—even bitter. But all that changed when I defined why I wanted my kids playing. Instead of fretting about their performance, I saw opportunities for them to grow. Now I enjoy watching them play without letting politics, other parents, or my own unrealistic expectations get in the way. Join me in exploring the realities of sports, the reasons parents get caught up in unhealthy competition, and strategies to keep the big picture in mind when we're too close to the game. We can be composed and confident while our kids are in sports. I knew Jill and I shared a lot in common when it came to our boys playing baseball. We'd shared many texts while sitting on the sidelines--both in different states--as we watched our boys play. So it was no surprise to me when she mentioned she was writing this book. What was a delight, however, was my chance to read it. This book encompasses far more than baseball moms. This book hits to the heart of any parent who's had a child participate in the sports arena. Jill brings truths that need to be heard while pairing them with funny, personal stories that we can all relate to. She holds nothing back and truly delivers a survival guide that challenges us as parents in how we tackle these sideline years. I happily recommend this book to anyone who has a child in sports. You can purchase it here.